Not all days are good days for a Starfleet captain. Share Captain Picard’s dismay with the Star Trek The Next Generation Facepalm T-Shirt. 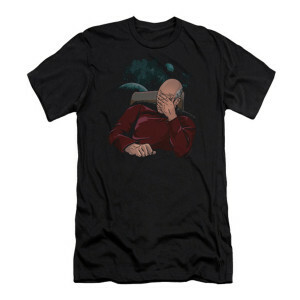 This soft t-shirt features the classic pose of the captain of the Enterprise. Super fit, washes well. And looks great. Fantastic shirt! I received many compliments on it. The fit was perfect. I love this picture of Starfleet’s greatest Captain. Great purchase. This shirt is awesome and reminds me of Picard earl grey! This is what happens when you share too much Aldebaran whiskey.